My husband is a huge fan of Mexican chorizo with eggs. I'm okay with eating it, but it's really not my favorite. Anytime we go out for breakfast, we go to a little dive Mexican restaurant and he gets a chorizo and egg burrito and I always get carne guisada, which is kind of beef tips in a "gravy." It's to die for. Anywho, I came across a recipe for Chorizo Enfrijoladas con Queso. Chorizo is a Mexican uncooked sausage. Enfrijoladas means "in beans," and queso, of course, means cheese. But what the heck does that really all mean? Well, these are crispy cheese tacos in a divine bean and chorizo sauce. And let me tell you, these are fantastic! There is something very special about the sauce that made me want to eat it all the time. So I guess I do like chorizo after all. My husband loved the sauce so much he combined it with, you guessed it, his eggs in a tortilla. Perfect! Good for breakfast, lunch or dinner. Enjoy! NOTES: You can really use any cheese you want here. Asadero tastes similar to American cheese, and Cotija is a salty, crumbly cheese. But this would work with pretty much whatever you want. 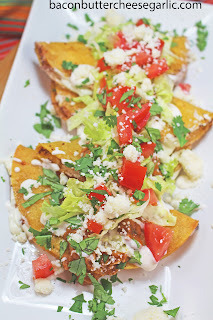 Also, frying these tacos can be a bit messy as some of the cheese will leak out. We have a small handheld skimmer to skim out the browned cheese in the oil between batches. Soften the corn tortillas in a damp towel in the microwave. Slice the Asadero cheese into 12 equal slices. Crumble the Cotija cheese. Put the Asadero cheese onto half of each tortilla and sprinkle in some Cotija cheese. Fold the tortillas in half and freeze on a sheet pan in a single layer for about an hour. Meanwhile, cook the chorizo until it's done. It kind of resembles a paste. Stir in the beans and the cup of water. Mash and cook the beans and chorizo until is somewhat smooth and to your desired consistency. Keep the sauce warm. Preheat the oven to 200 degrees. Heat a small layer of peanut oil in a large skillet. Fry the tacos in batches until they are golden brown on both sides. Drain them and keep them warm in the oven until they are all done. Serve the tacos with the chorizo bean sauce, Crema Mexicana, tomatoes, more Cotija cheese, cilantro, the tomatoes, and a squeeze of lime juice over the top. So yesterday I did a lot of prep cooking for dinners throughout the week. I'm really excited about some of them, so stay tuned to see how they turned out. One of the dishes actually has homemade Parmesan broth! Exciting, huh! While I was prep cooking, I also prepped dinner for these crazy good Baja Chicken Tostadas. I know, the ingredient list is a little long, but it was so worth the effort. 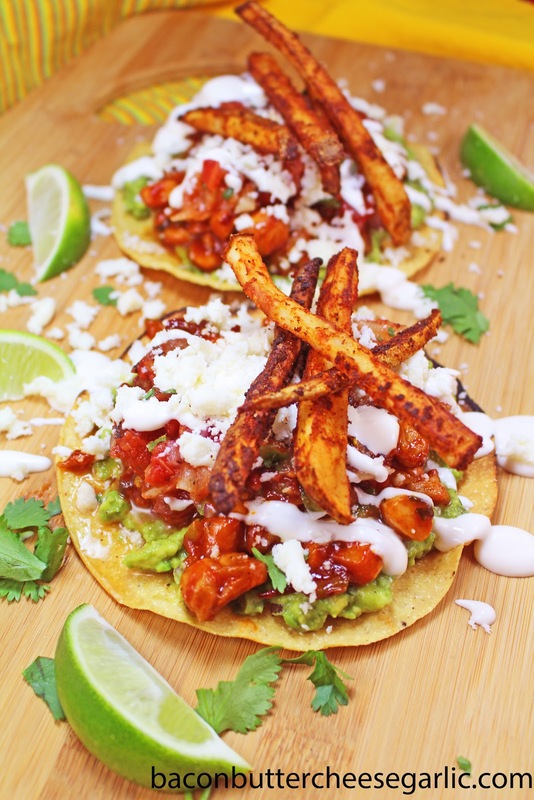 You could take some shortcuts like buying bottled BBQ sauce or frozen french fries (yes, there are fries on a tostada!) or even buying the salsa. But, if you have the time, these are fantastic! There is a spicy and citrusy BBQ sauce that the chicken is marinated and cooked in. There is a fire-roasted pineapple salsa, guacamole, and some super spicy crispy fries on top. There were absolutely no leftovers, as my son devoured all of the remaining chicken. I hope you enjoy these as much as we did! NOTES: You could use boneless skinless chicken breasts in place of the thighs. Also, read the paragraphs above the ingredients list if you want to use shortcuts. Also, the seasonings and spices on the fries are a guesstimate on my part. Our fries were quite spicy and I'm sure I used more than I suggested since I really didn't measure. So use your best guess on how spicy or not spicy you want them. Another shortcut would be to use crushed pineapple, drained, in place of the chunk pineapple so that you don't have to chop it. Mix the "chicken" ingredients together with the chicken and marinate the chicken for at least an hour. Mix the salsa ingredients together and put it in the fridge until you're ready to use it. Mash the avocados and stir in the remaining ingredients for the guacamole. Put it in the fridge until you're ready to use it. For the spicy crispy fries, preheat the oven to 425 degrees. Spread the fries out on a sheet pan. Drizzle them with some olive oil and sprinkle on the seasonings and spices. Toss with your hands to coat. Bake them for 20 minutes, then flip them over, and turn the pan around and back into the oven for about 15 to 20 minutes or until they're crispy. Halfway into the fries cooking time, drizzle a little olive oil into a skillet. Preheat the skillet to medium high heat. Dump the chicken and all of the marinade ingredients into the skillet. Cook the chicken for about 8-10 minutes or until it's done. Keep the chicken warm until you're ready to eat. Heat the tostada shells as directed or over an open flame on a gas stove. To assemble the tostadas, spread some guacamole on the tostada shell. Top the guacamole with the chicken, crema Mexicana, Cotija cheese, and fresh cilantro. Our daughter and oldest child will graduate from high school in seven days. We have been scurrying around trying to put together outfits, menu plans for the party, and deep cleaning the house for company. It's a strange feeling to have a child that is now a grownup. I remember all too well her days as a toddler, her first words, her sweet innocence. But now I get to look forward to her being my friend instead of my "responsibility." We made a fancy dinner for her called Coquilles St. Jacques. In French, the words just mean "scallops." But in the cooking world, it's a dish where the scallops are cooked in a creamy sauce with a covering of bread crumbs and cheese. It's very easy to make and very tasty. It's also pretty fancy, so it would be great to impress your friends. One of my husband's favorite foods is scallops, so it was definitely a hit for him. Maybe it will be a hit for you too! Preheat the oven to 400 degrees. 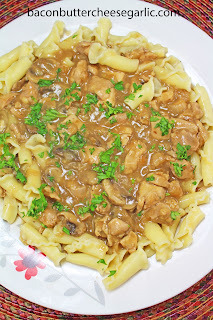 Melt the butter in a skillet and cook the shallots, mushrooms, and garlic until the mushrooms are tender. Add in the wine and deglaze the pan. Sprinkle the flour over the mushrooms and stir it. Add in the clam juice (or chicken stock), cream, and salt and pepper. Cook on medium heat until it's thickened and bubbly. 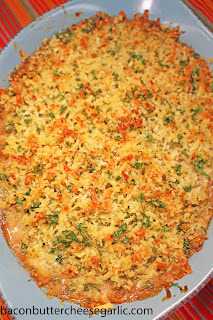 Stir together the panko breadcrumbs, parsley, Gruyere cheese and the olive oil. Grease a baking dish and put the scallops in the dish. Pour the mushroom mixture all over the scallops. Spread the panko mixture over the top of the scallops. Bake it for about 20-25 minutes or until the scallops are cooked through. West Texas has some crazy weather. It's been really hot all week, and then today it's cold and rainy. It's a good day to not do a whole lot. We've been on the couch pretty much all day. But, when you work as much as I do which is roughly 53 hours a week, six days a week, then I think we all deserve a lazy day every now and then. I am a huge sandwich fan, especially when they look fancy. 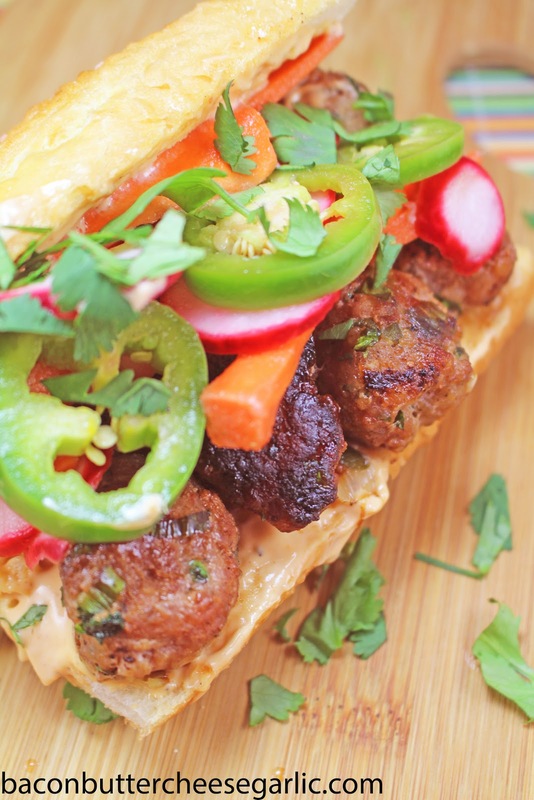 This sandwich is a Meatball Bahn Mi. A bahn mi is a Vietnamese sandwich that usually has some type of meat, pickled veggies, and a spicy sauce. My version is pretty quick to make. There are pickled carrots, radishes, and jalapenos. And there's a spicy Sriracha mayo and fresh cilantro all on a chewy baguette. These were fantastic and my picky 15-year-old son loved it! Enjoy! For the pickled veggies, mix together the vinegar, sugar, sesame oil, garlic, and salt. Put the veggies in a bowl and pour the mixture over the veggies. Chill, stirring occasionally, for at least an hour. Whisk the spicy mayo ingredients together and chill it until you're ready to use it. If you'd like the baguettes to be warm, wrap them in foil and put them in a 200 degree oven while you cook the meatballs. Mix together the meatball ingredients. Form the meatballs into about ping pong ball size. Drizzle a little oil in a skillet and cook the meatballs on medium high heat, turning occasionally, until they are all browned and done through. Open the three baguettes and spread on some spicy mayo and top with the meatballs, pickled veggies and fresh cilantro. This is a really fun way to eat and enjoy pasta. 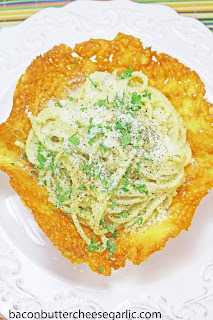 This Parmesan Pasta Bowl is really easy to make and it's darn tasty! And you can eat the bowl! This comes together quickly and it's meatless for those of you who don't eat meat or are cutting back. Enjoy! 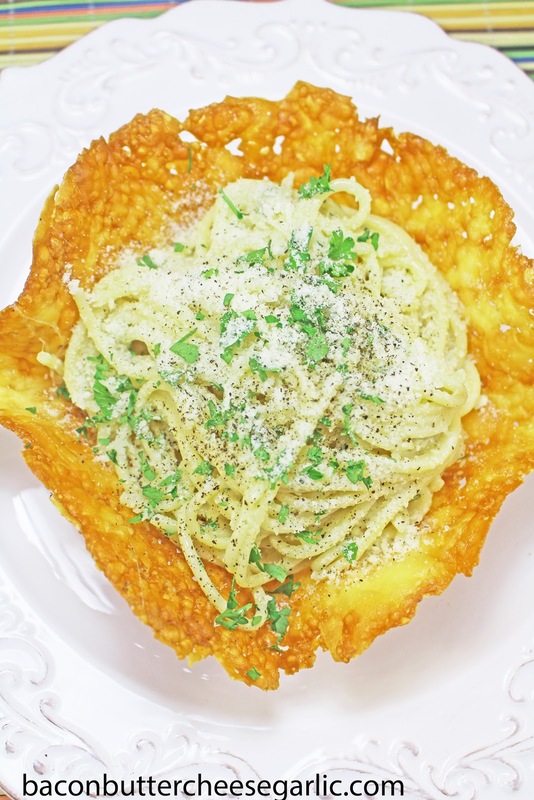 NOTE: You must use parchment paper for the Parmesan bowls in order for the bowls not to stick. Preheat the oven to 375 degrees. Turn four small bowls upside down (this is for shaping the Parmesan bowls later). Put a sheet of parchment paper onto a large sheet pan. Spread the 3 C Parmesan cheese into four 8-inch circles onto the parchment paper. Put the pan in the oven and bake the circles 6-8 minutes or until the cheese is all melted and golden brown. Remove them from the oven. With a thin spatula, immediately lift the circles off of the parchment paper and place them on the upside down bowls. Let them harden. Meanwhile, cook the spaghetti according to package directions. Save 1 C of the pasta water before draining the pasta. Melt the butter in the same pot and drizzle in the olive oil. Cook the garlic and minced onion over medium heat for a minute. Add the pasta back to the pot along with the pasta water, black pepper, and half of the Parmesan Romano blend. Stir and melt the cheese. Remove it from the heat. Serve the pasta in the bowls and garnish with the remaining Parmesan Romano blend and the parsley. So a lot of people, like us, usually fit in a "Taco Night" maybe once a week. We love all kinds of tacos in our house, so we probably eat more than most people. 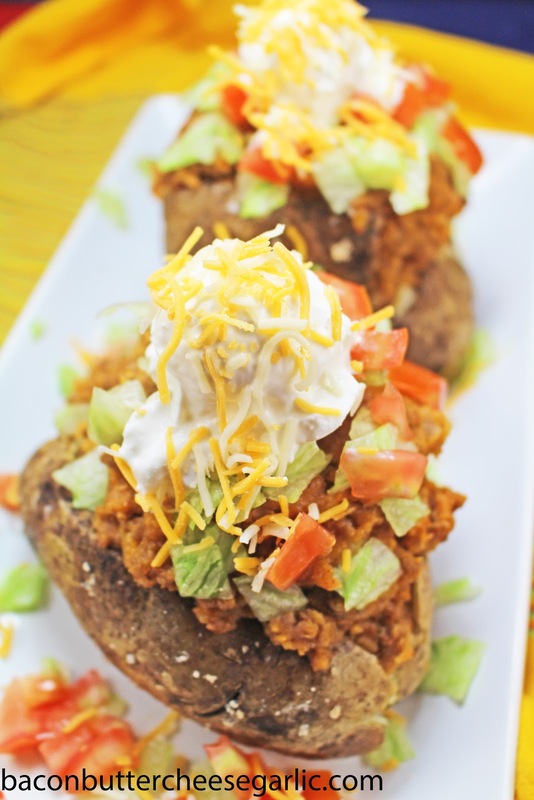 But what if you paired a taco with a baked potato? Intrigued? My Twice-Baked Taco Potatoes were spectacular! Everyone was very skeptical and thought it wouldn't be good. But, when they ate them, they all wished it made more than 4 potatoes! They are that darn tasty and easy too! Preheat the oven to 400 degrees. Wash and dry the potatoes. Rub them with olive oil, salt & pepper. Wrap them in foil and bake them about an hour or until they are soft. When the potatoes are almost done, cook the hamburger meat, onions and garlic in a skillet until the meat is done. Drain the grease, if necessary. Add in the taco seasoning and the water called for on the packet and cook a few minutes to cook out the liquid. Set the meat aside. Reduce the oven temp to 350 degrees. Cut into the potatoes and scoop the insides of the potato out into a bowl, being careful to keep the skins intact. Mash the potatoes with the sour cream and butter and a bit of salt and pepper, if desired. Stir the taco meat into the mashed potato mixture. Fill the potato skins back up with the mixture. It will be heaping. Top with some cheese and return them to the oven for about 10 minutes or until they are heated through. Serve with sour cream, salsa, chopped tomatoes, lettuce, and cheese. So you've probably heard of French Onion Soup. It gets cooked awhile to caramelize the onions and develop rich flavor. It's got savory beef broth and Swiss cheese on top. It's delicious. But what if we used chicken instead. Just what if. I'm game, and I did it! 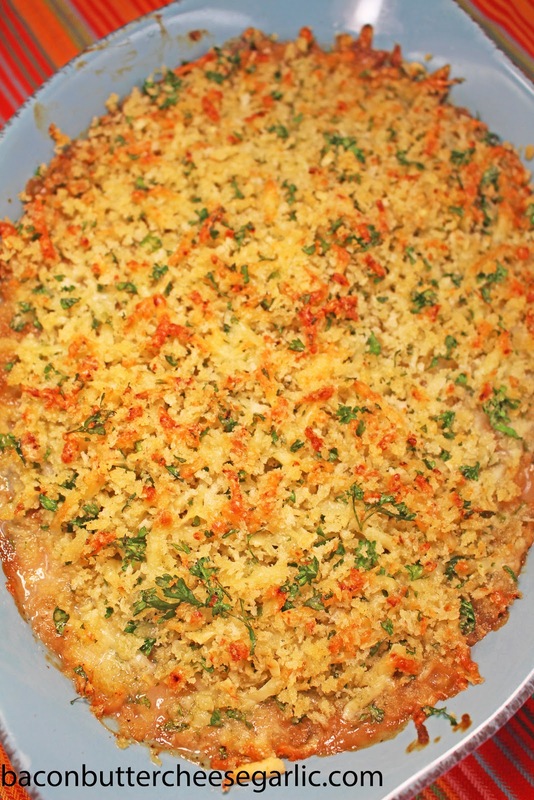 I actually made this French Onion Chicken twice. The first time I thought we needed it on a sandwich. But the problem was there was too much liquid, and we drained some out. The sandwiches were fantastic! But halfway through dinner, my husband and I both thought, wow, this is so good and why did we throw away so much flavor. So we did it again, kept the sauce, and served it over pasta. It's truly darn tasty! It would also be good over rice or even over mashed potatoes for a heartier meal. It comes together relatively quickly and disappears even quicker. I hope you enjoy it as much as we did! Meanwhile, melt the butter in a dutch oven or large skillet with a lid and add in the vegetable oil, onions, and pinch of sugar. Cover the pot and cook the onions over medium high heat for about 15 minutes, stirring occasionally. Remove the lid. Cook and stir the onions continuously until they are browned. Add in the chicken and garlic. Cook the chicken until it is done through. Add in the flour and stir. Add in the beef broth, mushrooms, thyme, balsamic vinegar, mustard, and thyme. Bring it to a boil and reduce the heat to medium. Cook for about 10-15 minutes or until the sauce is thickened. Season the sauce with salt and pepper. Stir in the cheese until the cheese is melted. Serve the chicken over the pasta (or rice or mashed potatoes). These are fantastic little sliders with a sort of loose meat filling, not to be confused with traditional "Loose Meat" burgers. They are cheesy, savory, and sure to disappear. 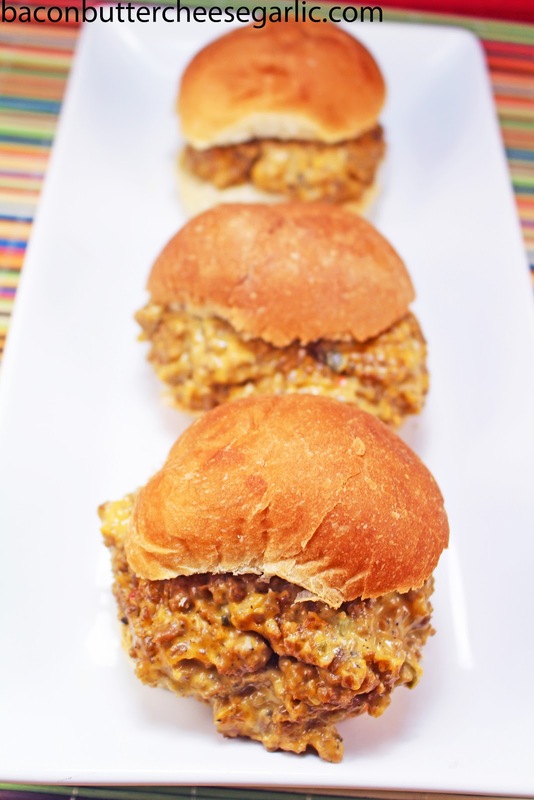 Try these Redneck Sliders at your next party or tailgate, and you will be surprised at how big a hit they will be. Enjoy! Preheat the oven to 200 degrees. Wrap the slider buns in foil and put them in the oven to warm while you cook the filling. Drizzle some olive oil in a skillet and preheat it to medium high heat. Cook the onion and serrano until they are soft, about 3-4 minutes. Add in the hamburger meat, sausage, garlic and black pepper. Cook the mixture and break it up until it's browned and cooked through. Drain grease, if necessary. Add in the Worcestershire sauce, ketchup and mustard and stir. Add in the Velveeta and cook and stir until the cheese is completely melted and smooth. Remove it from the heat. Serve the meat on the buns.